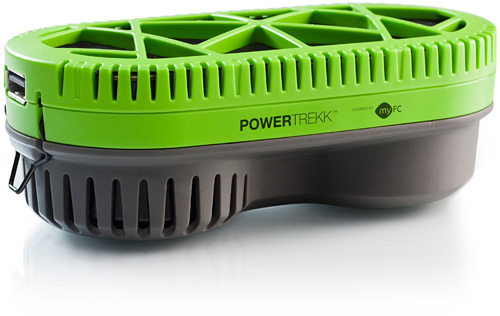 PowerTrekk Fuel Cell Powered Charger | OhGizmo! The prospect of one day being able to recharge your gadgets with nothing more than a spoonful of H20 is very tantalizing, and the PowerTrekk Fuel Cell Charger could be the closest thing to that dream you can get your hands on today. Or very soon at the least. It’s a combination portable battery pack and fuel cell that promises to provide all the juice you need when you’re away from an outlet, since it turns regular old water (at least the hydrogen portion) into electricity. You just need to insert one of their PowerPukk fuel packs, add about a tablespoon of water, and instantly the power will start to flow. But of course the success of the PowerTrekk completely relies on these replaceable PowerPukks, and at the moment I have a lot of questions the company’s website simply does not have the answers for. Like how much the pucks cost and just how much power they each provide. And even though they have to be recycled when spent (the pucks are considered electronic waste afterwards) does the PowerTrekk end up being more efficient and/or eco-friendly than just hauling around a few extra rechargeable battery packs? Hopefully these questions and more will be answered next week as the official worldwide launch for the PowerTrekk takes place at the Mobile World Congress show. This is really neat! Imagine being able to charge your phone in the middle of the forest or even in the middle of the ocean? lol This is definitely one innovative device here. unfortunately it takes more energy to split the water molecule than is recovered by re-combining the hydrogen with the oxygen. I doubt that this is a hydrogen fuel cell….at least with the hydrogen coming from the water you add.